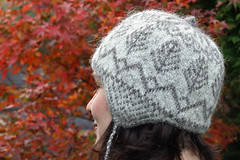 Elements Hat | Domesticated Human Elements Hat | Online home of Crystal Flanagan. Knitter, spinner, sewer, weaver, canner, baker. 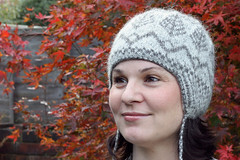 A helmet-style stranded hat knit in an earthy Lopi and lined for warmth and comfort. The elements of my British Columbia home are on display; starting at the ears and brim with water, moving to mountains, pines, wind, and the final decreases turn into sun rays. Not only does this hat remind you of the elements, it also protects you from them with its dual layers and intense cosiness. Notions: Yarn needle, scissors, 5mm crochet hook, stitch holder, stitch marker. 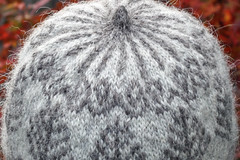 Notes: This hat is knit starting separately with each ear flap, then casting on stitches for the front and back to join the ear flaps together. 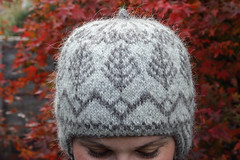 The lining I knit was from some of my handspun; however feel free to use whatever yarn you find cosy for the lining as long as it knits up at the same gauge as the pattern yarn.